A Daily Dose of Fit: Pinspiration Thursday: Focus on today. I'm an incessant planner. I have this need to be in control at all times. Not in an obsessive, mean-girl way. I just like to know what's happening next and I like to be prepared for it. My husband jokes that he's not allowed to surprise me. One time, he tried to scoop me away for the weekend and I got really stressed about what to pack, and then I stressed out about having everything that I'd need. I was ultimately fine, but still. I'm a girl. I like to plan my outfits. I know this can be a problem. Sometimes, I get so wrapped up in what's to come that I forget about what's already right before me. I am slowly...slowly learning that life can't always be planned down to the minute. Because when you do that, you lost the minutes that are taking place right in front of you. I don't want to lose minutes. Not one single precious minute. They're mine and I want all of them. And I want to share them with everyone around me. Hannah is teaching me how important this is. She's my baby, but not really. She's a toddler, growing up ever so quickly right before my eyes. 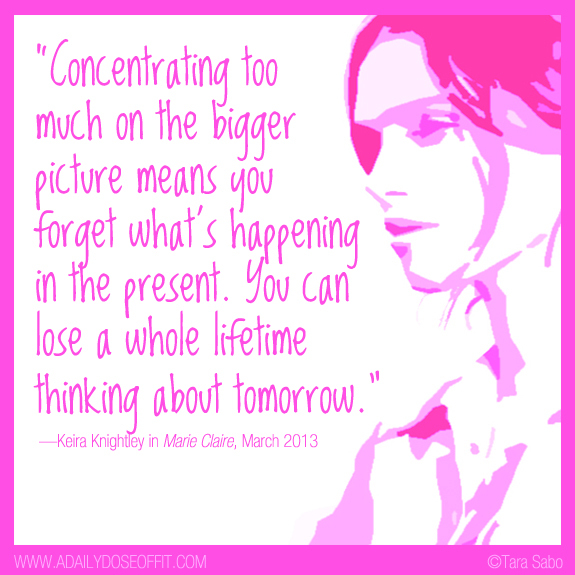 If I focus on tomorrow...if I try to plan too much of tomorrow...I'll miss what's happening today. I don't want to miss any second of that precious little lady's life. I just don't. So I'm working on living in the present with just a handful of thoughts on tomorrow. Because you can't really, totally forget about tomorrow. Tomorrow will always come, but today will never come back. Question: How do you help yourself live in the moment? I think meditation helps me be present. It settles me and helps get my day off to a mindful start. This is a topic that super important to me. When I was in grad school, I read a lot about "mindfulness" and fully experiencing the present. One of the simple tricks that I do is take a few minutes to pay attention to my 5 senses. Helps me feel like I am soaking up everything around me. I really struggle with trying to be "spontaneous" and trying to live in the moment. I am married to a spontaneous man, so it can be challenging. I tell myself "if I do this today, tomorrow I can do what I want." I'm not very good at meditating. I can't get my mind to be still!